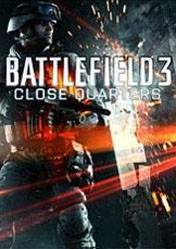 Battlefield 3: Close Quarters is a themed expansion pack bringing the team play of Battlefield 3 to tight indoor environments. The frantic close quarters infantry combat is amplified by unprecedented high definition destruction, new ways to play, more weapons and added persistence. The HD Destruction in Battlefield 3: Close Quarters lets players riddle the environment with bullets, reducing entire locales to ruin. Everything from furniture to plaster can be shot to pieces, and players can see the result of the mayhem as rubble and broken pieces pile up on the floor. The tight level design and many opportunities for vertical gameplay create a highly competitive environment.